On a sunny Oklahoma summer day, the temperature in your attic can climb as high as 140 degrees. With so much heat collecting in the confined space of an attic, your air conditioning system has to work harder and longer to keep your home comfortable. To help with your energy costs TRS Roofing recommends adequate roofing ventilation and Energy Efficient Cool Roofing with good insulation. Attic insulation can help to slow the movement of heat into your home, but what about the roof shingles that are absorbing all that solar heat? Energy-efficient shingles installed by the roofing experts at TRS Roofing can help reduce heat in the attic and any heat going into the house, helping to keep your home cooler in the summer and your air conditioning bills lower. Energy Efficient Cool Roofing has been designed to reflect more sunlight and absorb less heat than a standard roof. Cool roofs can be made of a highly reflective type of paint, a sheet covering, or highly reflective tiles or shingles. Nearly any type of building can benefit from a cool roof, but consider the climate and other factors before deciding to install one. • Decreasing roof temperature, which may extend roof service life. • Reduce power plant emissions, including carbon dioxide, sulfur dioxide, nitrous oxides, and mercury, by reducing cooling energy use in buildings. Landmark Solaris by CertainTeed . Landmark Solaris® Gold from CertainTeed Roofing is a brilliant energy-saving breakthrough that puts cool roof technology to work. Landmark Solaris Energy Efficient Cool Roofing is a steep-slope, solar reflective asphalt roofing shingle which contains advanced colored granules that reflect solar energy and radiate heat far better than traditional roofing shingles, reducing your roof’s temperature in the summer. 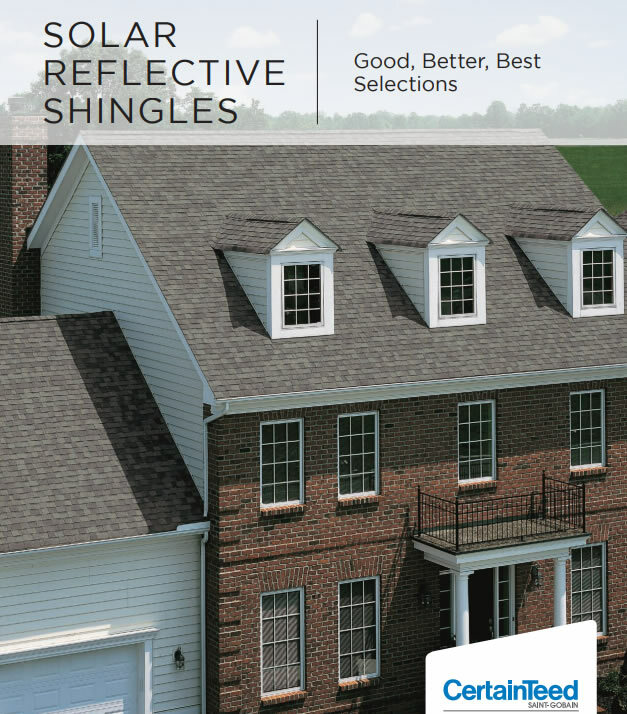 Solaris shingles may qualify for credits/points in LEED®, NAHB® and other “green” programs. And, our palette of rich, authentic colors makes Landmark Solaris GOLD an easy choice for eco-friendly living.